For the past few months, Rusty Crawford from Accutime Timing Systems and Bob Brockmeyer have been talking about the possibility of Accutime utilizing the feature in their timing systems. "From the start, Peter Biondo, Kyle Seipel and myself have believed that TruSTART is great for the sport of handicapped drag racing," stated Brockmeyer. "To continue our vision, it made sense to team up with Accutime, licensing it for use on their systems so that it becomes more the nationwide standard." "I've always enjoyed being the faster car and I still do." said Biondo, winner of a number of big races in his career. "You can see the finish line play out better and that will never change. I just never understood why there should also be that disadvantage on the tree if the slower car went red and lost to the faster car with a worst red-light. I was happy to hear that Rusty and Accutime shared in this vision. This is a huge step in making it a nationwide timing system staple." 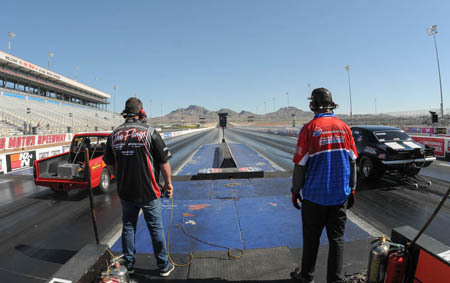 Compulink and Accutime combine to supply timing systems to over 80-percent of the country's drag strips and both are accomplished racers themselves. Brockmeyer dominated the Super Pro classes at Bandimere Speedway in Colorado in the early 80's while Crawford also won many high dollar bracket races himself before he started Accutime Timing Systems. Crawford is a big believer in this Worst Red technology. "I never liked the fact that the slower car always had more pressure when shooting for a good reaction time, yet at the same time had to keep it green or the race would be over regardless if the quicker car went red worse," he said. "It's been long overdue and I look forward to offering it within my Accutime operating system to all of my race tracks."